...but it's a slightly more valid lifestyle choice if that light at the end of the tunnel led somewhere that wasn't just the ugly glare of another Monday morning, and as anyone familiar with life here in the real world knows, that just isn't happening. The last couple of years had been a bit of a rollercoaster for White Light Parade. 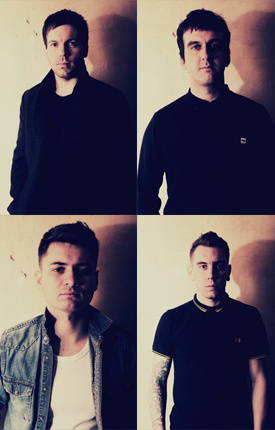 Two singles, 'Wait For The Weekend' and 'Turning All The Lights Down', which won support from XFM and Radio 1's Huw Stephens and stormed the UK indie charts. Sell-out shows and tours with Kasabian, Fightstar, Reverend And The Makers, and The Subways. A song, 'Rebellion Call', written in collaboration with Itch from The King Blues, and a track – the Mick Jones-channelling 'Riot In The City' – plucked for the soundtrack to the 22-million selling videogame sensation Grand Theft Auto IV. Oh, and don't forget the band's well-received debut album, 2009's 'House Of Commons', which won glowing reviews and won the band fans as far away as Japan. But as the band came off tour and returned to their home turf of Bradford, West Yorkshire, it felt like time to sit back, take stock, and think things over. 'House Of Commons' was a record that dealt directly with the realities of life in recession British – being skint, getting in scrapes, getting away with it by the skin of your teeth – all to a rowdy, urgent soundtrack steeped in Britrock favourites from Oasis to The Clash and The Jam. "The debut album was our way of sending out a message to people," says front-man Danny Yates. "It was all about our way of life, and the state of the UK at the time. But with our new songs, we didn't want to just go and do the same things again. We wanted to experiment, to test ourselves lyrically and musically. The first album will always be there for people to listen to, but now we're pushing ourselves in a whole new direction." The seeds of this new direction came last July, when Danny received a call from the group's label, Split. Their album track 'Young Believers' had been picked up as featured music by American sports broadcasters ESPN, and this gem of good news proved the spur to end the six-month hiatus and get the old gang - Danny's brother, guitarist Jonno and bassist Tom Emmett – back together for a jam. Add Danny's old friend Mark Lewalski on drums, and suddenly this felt like a band with a new lease of life. A band ready to take on the world all over again. You can hear all this in new single 'Want You To Know'. Winding together chiming, uplifting guitars and a lyric that balances self-doubt with belief and resolve, it feels like a new beginning, the sound of a band using their past experience to make something pure, honest and real. "Our first stuff was angry, punky – about life in a small town, struggling in the recession," says Danny. "The new stuff is about looking inside yourself, questioning yourself. They're about growing up in Bradford but looking outside of that, trying to better yourself. They're songs of hope, really."